It has been a while. I haven't been able to bring myself to come back to my blog for a while, as things have not been so great. 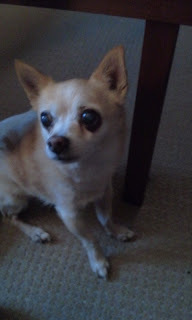 My darling angel Nugget, my beautiful little Chihuahua got sick early in the New Year and I had to make the heart breaking decision to end his suffering. It was very quick, he had a massive seizure and just didn't really recover. As I had lost Buster in November, I knew what I had to do. I cry every day. I miss my beautiful boys, but they are together now. Sleep my beautiful little boy. I love you so very much. I'm very, very sorry for your loss, Kitty.